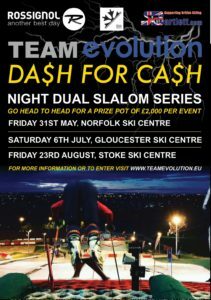 The ERSA sponsor, Team Evolution, are once again holding their charity “Dash for CA$H” event. This race is open to all racers, registered or not, so if you think you are fast enough to win the cash please come along and have a go. A free BBQ will be provided for all entrants courtesy of WSF and event sponsors. After the time trials the top 32 will race head to head in the DASH FOR CASH main event. FIRST PLACE AWARD £1000.00 event winner, £500 fastest opposite gender to winner, £500 fastest racer U16 or below. Entry Fees to WSF Charity to provide bursaries for skiers in the regions More information to be published soon, or contact info@teamevoltuion.eu All profit from the event will be donated to The Winter Sports Foundation. Those not placed in the top 32 will compete in the Heroes Cup Event with some excellent awards. LIMITED TO THE FIRST 100 ENTRIES.